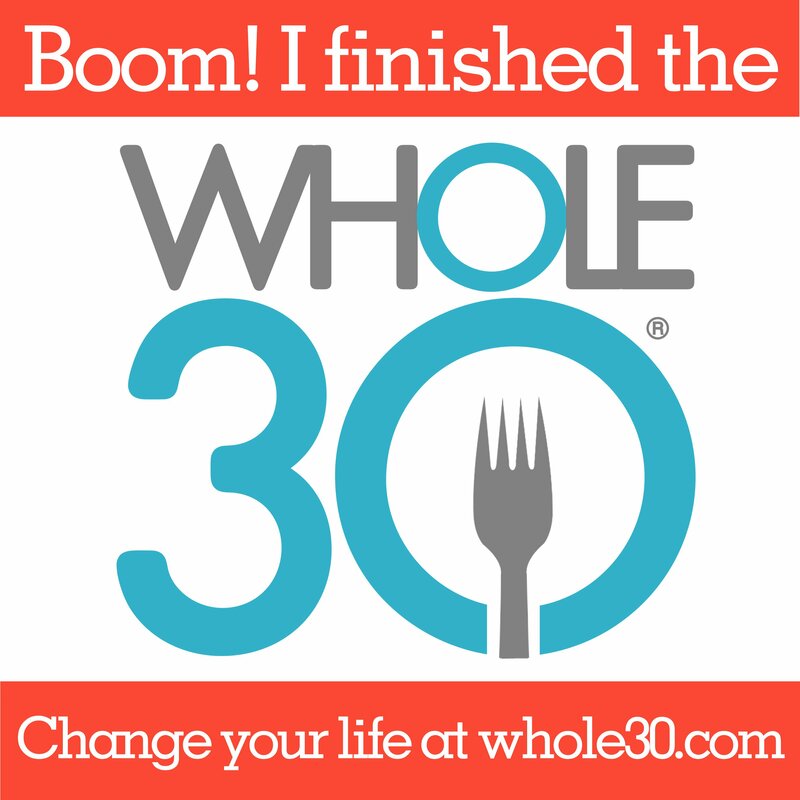 Before I get to CAKE BALL FAIL… I’ll discuss my workout this morning… then I’ll move on to last nights cookin’! 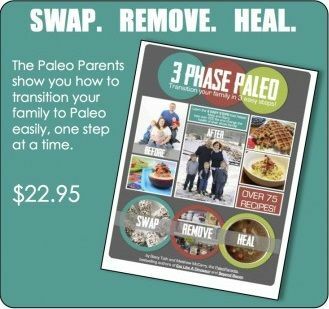 Now for last night…..So my Paleo Cake Balls were an epic FAIL, my kids including myself were sure we would never erase the taste from our mouths. When you get too much unsweetened chocolate in one large ball it’s pretty disgusting! 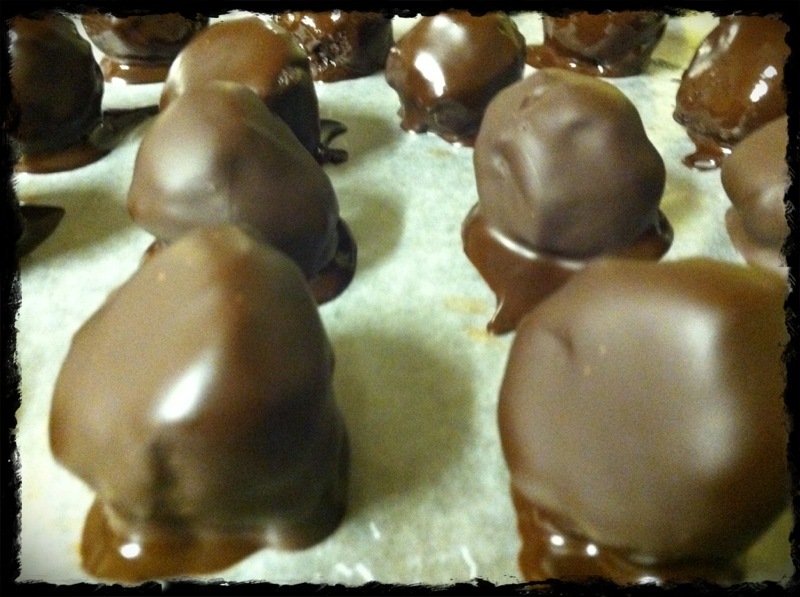 Although they came out just as pretty looking as any NON PALEO cake balls I have ever made. There will be a round 2, I promise, I just have to find a “good” PALEO frosting to mix with my cake crumbles. Cake Balls lookin pretty .... TASTE HORRIBLE! It turned out quite tasty and the family seemed to agree. I feel that I liked it best since I scarfed it down or maybe I was just that hungry. 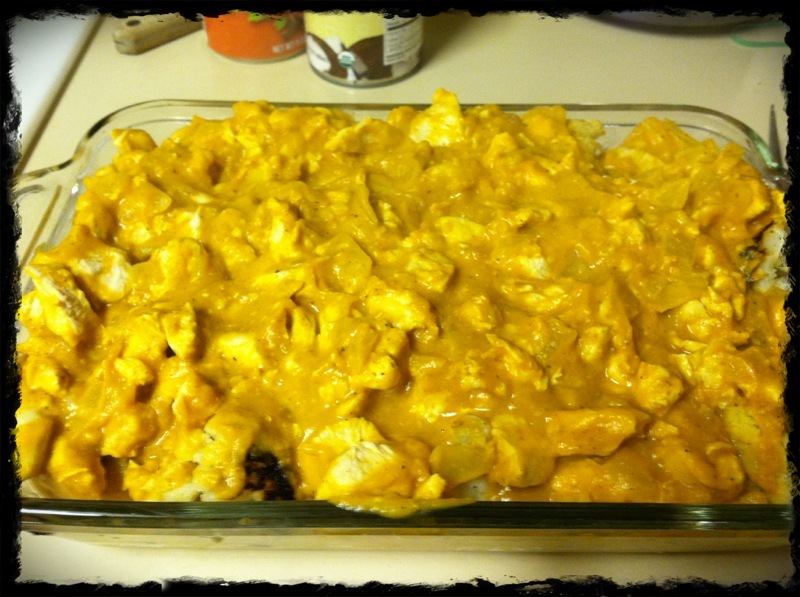 Paleo Pumpkin Cream Chicken Casserole Served! Time to roast our veggggggies! Chop your cauliflower and put it in a baking dish topped with a little bit of olive oil and salt and pepper. Then cut your spaghetti squash in half, use a spoon to scoop out the seeds and extra threads, place face down on a baking pan. 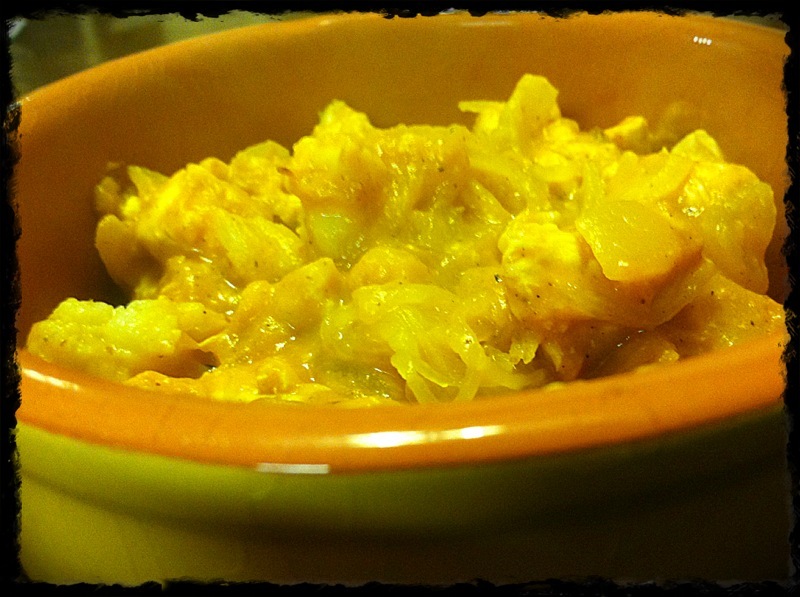 Add the cauliflower and spaghetti squash to the oven, side by side if possible, to roast for around 25 minutes. (Depending how big your spaghetti squash is, the cauliflower made roast a little quicker, but mine cooked at the same time) You will know your spaghetti squash is cooked when you can poke the outside skin and it gives a bit. While the squash and cauliflower are cooking, it’s time to cook up your chicken. Pull out either a LARGE saucepan or a large pot and put under medium-high heat. Add olive oil to it along with your minced garlic. Once the garlic begins to smell, add your chopped onions and cook until translucent. Add your chopped chicken to the cooking onions, cover and let steam for around 5 minutes. Once the chicken is about 2/3 cooked through, add your can of pumpkin, half can of coconut milk, and spices directly to the pan. Mix thoroughly. Taste to see if you need any more spices or salt. Once your squash and cauliflower is done cooking, and chicken saucey mixture is heated up, de-thread spaghetti squash with a fork, running the fork the opposite way of the threads. Add your spaghetti squash threads, roasted cauliflower, and chicken saucey mixture to a 9×11 glass baking dish and add dish to the oven under the broiler. Cook for about 5 minutes, getting a little dark on the top. Remove from oven and let sit for around 10 minutes to help the sauce thicken up. Then EAT! It’s good stuff and rather easy to make. So I’ll leave you with a pic of our little zucchini sandwiches. 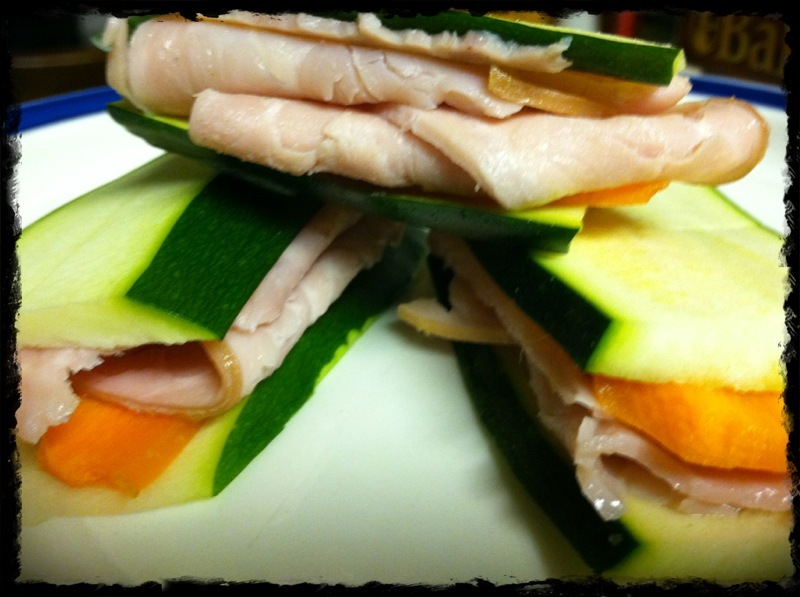 They have all natural, minimally processed, nitrate free ham, carrot slice and of course zucchini. Have a great Tuesday!